A newspaperman of the people, by the people and for the people -- that's Randy Stone of the Chicago Star, pounding the city streets night after night on the trail of crime, corruption, and haunting human interest stories! Frank Lovejoy stars as Stone in these sixteen digitally restored and remastered episodes from 1950. 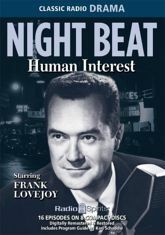 Sheldon Leonard, Joan Banks, William Conrad, Lurene Tuttle, Gerald Mohr, Betty Lou Gerson, Bill Johnstone, and more portray the complex characters in his intriguing adventures.